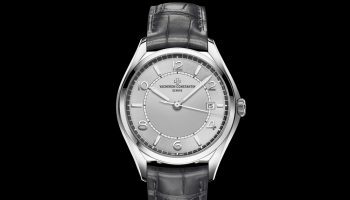 During this year’s SIHH Vacheron Constantin presented an amazing five new models with the name Overseas. The Overseas had just been floating around in the collection, so a new course was sorely needed; especially because the Audemars Piguet Royal Oak and Patek Philippe Nautilus are extremely popular sports watches in the highest segment of the market. 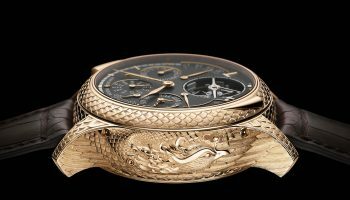 In addition to a basic variant with three hands, a chronograph, an ultra-thin version, a perpetual calendar and a women’s model, a very attractive variant has also appeared in the course of the ‘Overseas year’ that is one of a kind. The Overseas World Time has an appealing complication that none of the competition has. Time for an intimate meeting. The Vacheron Constantin Overseas World Time 7700V, which has the Hallmark of Geneva, is available in three colours: brown, grey and blue. I’m wearing the grey variant and my first impression is good. Very good, because the rubber strap is pleasant to wear and complements the look of the sports watch. 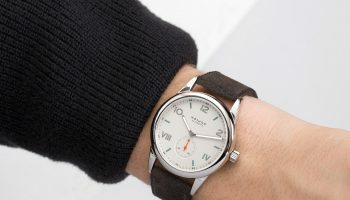 The entire Overseas collection is fitted with a system that allows for a quick and easy exchange of straps, and the watches are supplied with a steel bracelet as well as a leather and rubber strap. 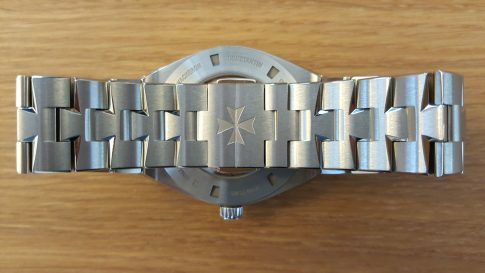 For every day test use the rubber version is the most practical because the steel bracelet – which is beautifully made, incidentally: partly satin-finished, partly polished and with links that are in harmony with the alternately flowing and angular lines of the case – isn’t the right size. Call it laziness, call it caution, but resizing the bracelet myself would be pushing it. With its diameter of 43.5mm and height of 12.6mm the case is just right. Not too big so it doesn’t lose its aristocratic character, and not too high for a shirt cuff. The most striking feature is of course the Lambert projection of the world map. In general terms watches with a world time function that divide the world into time zones in this way may resemble each other, but it’s in the framing and a range of subtle colour details and mechanical functionalities that major differences can be made. 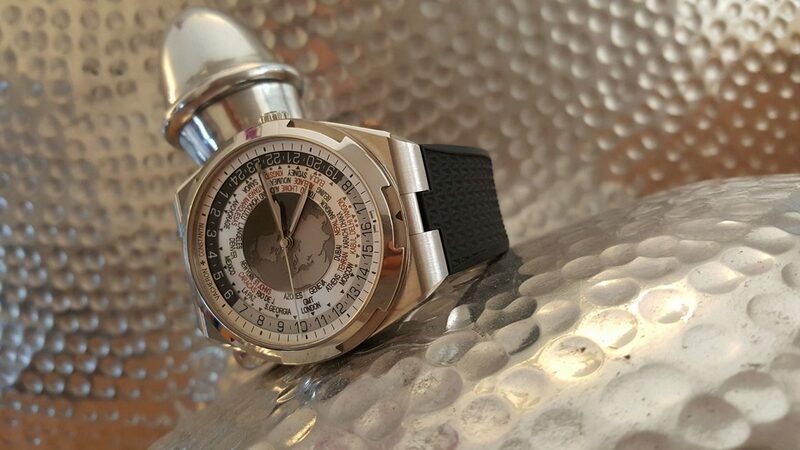 What sets this ‘Vacheron’ apart from a technical point of view is the ability to display the time in 37 time zones, including areas that are offset by a half or even quarter hour. No other mechanical world timer has this capability. 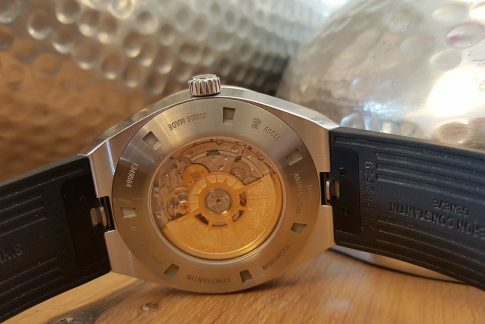 Of course taste is entirely subjective, but the grey shades of the test watch are both restrained and expressive and are a perfect match for the technical character of the case with its Genta DNA. The calibre that facilitates the strange time deviations has been awarded the renowned Hallmark of Geneva and is made in the company’s own manufacture; has been for some time, in fact, because the movement, calibre 2460 WT, also powers the gold Traditionnelle World Time from 2011 and the platinum variant that was presented in 2014. The movement in the Overseas has been given a different rotor, but otherwise it shows the hours, minutes, central seconds and world times with day/night display as per usual. The world, with the North Pole at its centre, is shown on three overlapping dials surrounded by a silver sapphire disc with the world cities. A sapphire ring is laid over the cities and the world and is synchronised with the 24-hour disc that has subtly graded tints from light to dark to indicate the difference between day and night. And finally, on the outer edge of the dial is a lacquered ring that indicates the hours and minutes in the time zones. Something to remember: a world timer doesn’t show two time zones simultaneously like the GMT watch, a watch like this Overseas World Time graphically depicts the time anywhere in the world. It’s a watch for dreamers, whereas a GMT watch is more a watch for doers. But that’s a side note – back to the everyday reality. On the wrist, the watch is a dream. The finish is superb, the movement is accurate, the 40-hour power reserve is a trifle scanty, but the watch has a very prominent presence. Everyone close to me, and sometimes even further away, notices and comments on the watch. And the comments are, without an exception, positive. The proportions are good and there is an excellent balance between glossy and satin surfaces. The picture of the world combined with the city names and the many numbers prove to be real eye catchers. 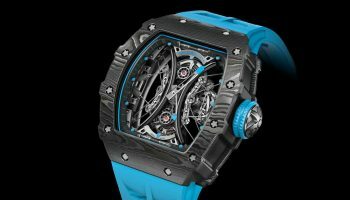 It will not come as any surprise that the watch is positioned at a high price point. At € 40,200 the price tag is definitely steep. However, this Overseas is difficult to position because the watch is very hard to compare to its peers. 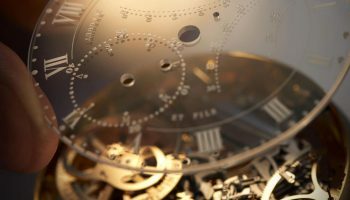 There simply isn’t a Nautilus or Royal Oak with world times, and when it comes to the level of the finish and the technology used it’s a definite no-no to make a comparison with Frédérique Constant or Montblanc models. The watch can be compared to the gold Vacheron Constantin Traditionnelle World Time. This is the watch that really sets the tone when it comes to pricing the steel sports watch, because with a precious metal case it costs € 52,400. 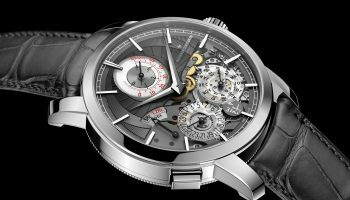 A somewhat comparable steel world time watch is the Jaeger-LeCoultre Geophysic Universal Time, which costs € 14,600 in steel and € 24,900 in rose gold. 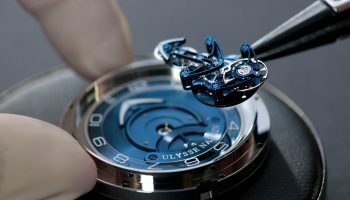 The Geophysic is also a manufacture product, but it doesn’t have the Hallmark of Geneva and the case shape is much more traditional. 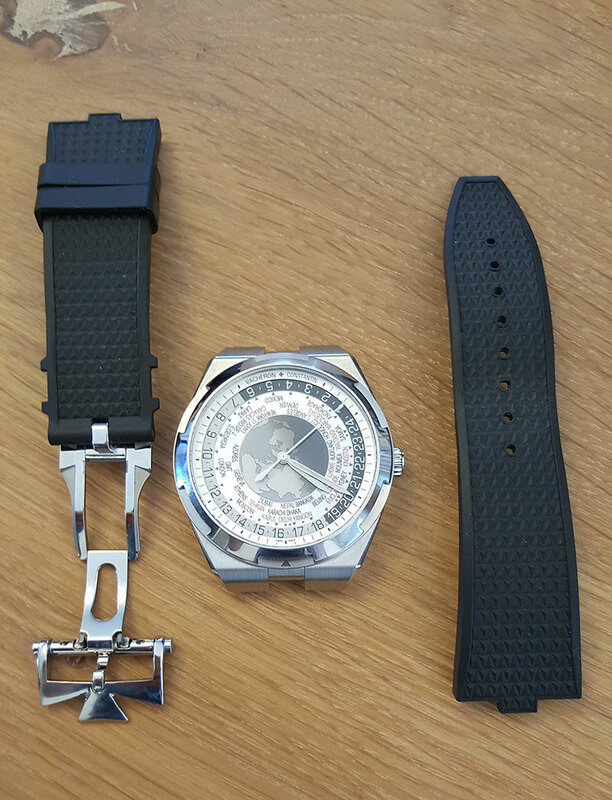 A comparison with the Patek Philippe Ref. 5131 World Time falls entirely short, because this watch has an enamelled dial and, partly because of that, is more than twice as expensive as the traditional Vacheron with world times. The Vacheron Constantin Overseas World Time is unique and fills a niche for wealthy dreamers. 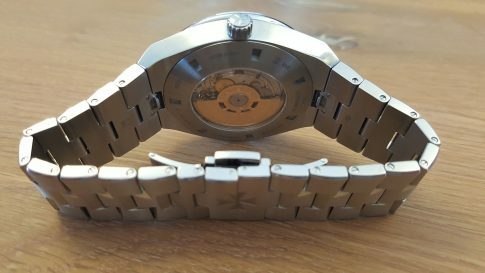 Case: steel, 43.5mm diameter and 12.6mm high, sapphire crystal with anti-reflective coating, sapphire case back, water resistant to 150m. 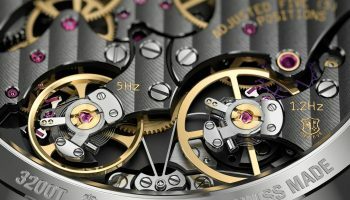 Movement: calibre 2460 WT, gold Overseas rotor, 40-hour power reserve, frequency of 28,800 vph, Hallmark of Geneva. Functions: hours, minutes, central seconds, world times in 37 time zones with day/night indicator. 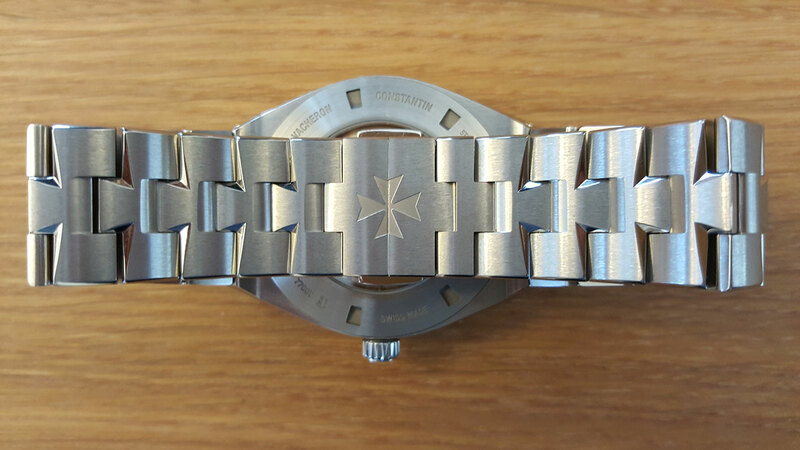 Strap/bracelet: steel with alternately satin-finished and polished links shaped into a half Maltese cross. Black, brown or blue alligator strap and a rubber strap in the same colours (depending on the dial version), with a three-part folding clasp.